So, August is grinding on and on and on, but there’s only a week left. Truth be told, September is nearly as bad, but at least by the time it rolls around you know the end is in sight. Plus, I’m taking a week’s vacation at the end of September, so… I got that going for me. I do not do photography during the summer, except for rare exceptions where I think of something that’s both air-conditioned and worthwhile to photograph–the Audubon Aquarium of the Americas in New Orleans was probably the most successful of those ventures. I like to spend the time I would usually be out photographing combing antique stores for more cameras, but that’s fraught with its own kind of peril, as small town Louisiana antique stores tend to be housed in old buildings that are poorly air-conditioned. Or not at all, as I learned to my horror when checking out a couple of “stores” in Sunset last spring that turned out to be old barns. It was only the first week of June and already terrible; I can’t imagine they actually keep the places open during the dog days of summer. Anyway, I’ve been slowly working my way through the Louisiana Antique Trail over the last few months, although I’m saving Slidell and Covington for when my bank account is a little more recovered from the car purchase. Those towns both contain large antique “districts” with several stores, and I’ll probably want to spend some real money. I haven’t had much luck finding anything at the stores I’ve visited thus far; I think hipsters are doing to vintage cameras what they did to vintage typewriters a few years ago. What I tend to find in stores lately is either broken and cruddy, or way overpriced. I did find a couple of fun items for my Conjure experiments at a store in Maurice (a small town between Abbeville and Lafayette) last weekend. 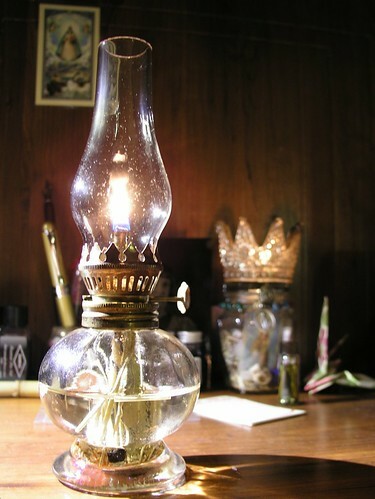 Small oil lamps are not at all an unusual item in antique stores, although finding a small clear one kind of is–for some reason the small ones tend to be opaque or painted glass. This one was only $12, and it was totally intact with a wick that had never been used (although it was severely frayed at both ends and I had to trim a bit off), so I bought it and turned it into a into a Road Opener spell lamp. 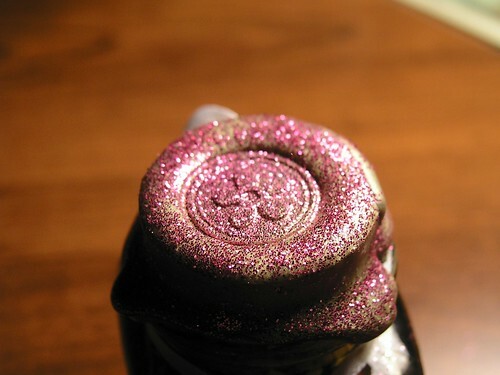 Some orange glitter. I was hoping it would make a suspension in the oil but alas, it’s too heavy and just settled to the bottom. I’m also waiting for delivery of a piece of tourmalinated quartz and I’m going to add that when I get it, assuming it’s small enough to fit in the lamp without taking up too much space. 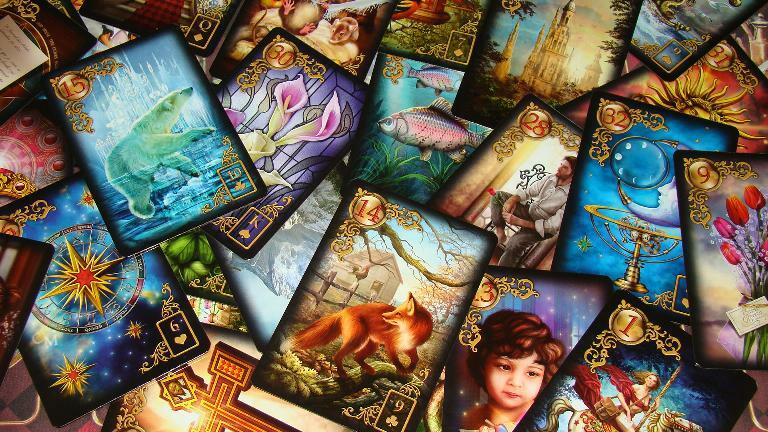 Crystals are not a traditional element of Conjure and to be honest I mostly consider them to be New Age Woo, but I just kind of felt like I wanted a crystal in this one and I’m going with my gut. File it under “Won’t hurt, could help”. One of the alleged elements of this stone is that it helps with “self-sabotage”, and that is definitely something I struggle with. Normally what I do with old bottles is carve a smaller cork out of a wine bottle cork, but this bottle is so tiny it didn’t seem like the best solution. I’m pleased with the workaround I came up with: I found an old glass bead big enough to not fall through the neck, and sealed it to the bottle with gold sealing wax. 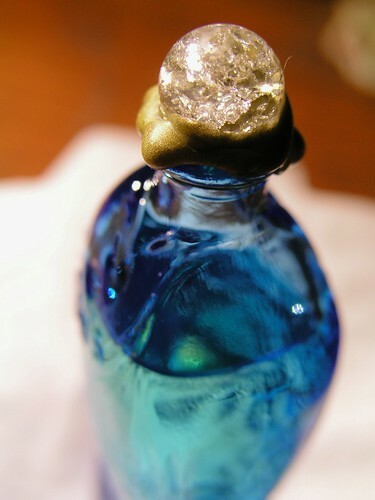 If I want to use the oil, all I have to do to re-seal the bottle is pass the bead through a candle flame to re-soften the wax, and then stick it back on the bottle neck. 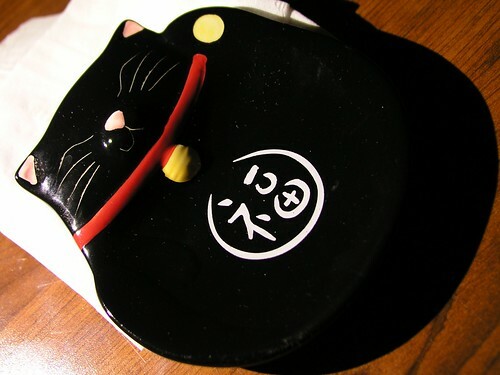 I also went to World Market that day, and I found this little Lucky Cat dish for just a few bucks, I think it’s supposed to hold used tea bags. It’s going on my prosperity altar to hold small offerings/items. My “family tradition” is Catholic and I mostly try to work within that and not appropriate much from other cultures, but Lucky Cat and Buddha are small exceptions, both on my prosperity altar. Oh, and I like the Hamsa, but that’s such an ancient symbol that it’s really kind of universal. 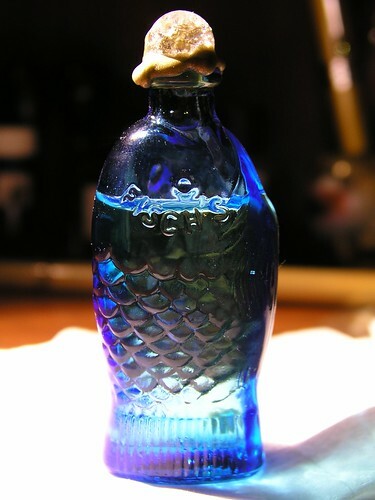 This is a Work Space Protection Witch Bottle; she listed one several months back and I loved it, but I was unemployed at the time so I couldn’t very well justify purchasing it. I’ve been watching her listings like a hawk since I started my new job in March, waiting for her to list another, and when she did I snatched it up within seconds. It’s on my desk at work. I can identify a cats’ eye shell (for deflecting the “evil eye” from negative co-workers), safety pins (witch bottles always have pins or needles or shards of glass in them), and what I think is Spanish moss? That’s sometimes a money-drawing element, but more commonly used for jinxing. (It’s also used for stuffing doll-babies, but that’s more for practical reasons.) It might be some other kind of moss or lichen, though. There’s also some stuff that’s a complete mystery, herbs and bits of stone and something that looks like a nut that’s been painted gold. 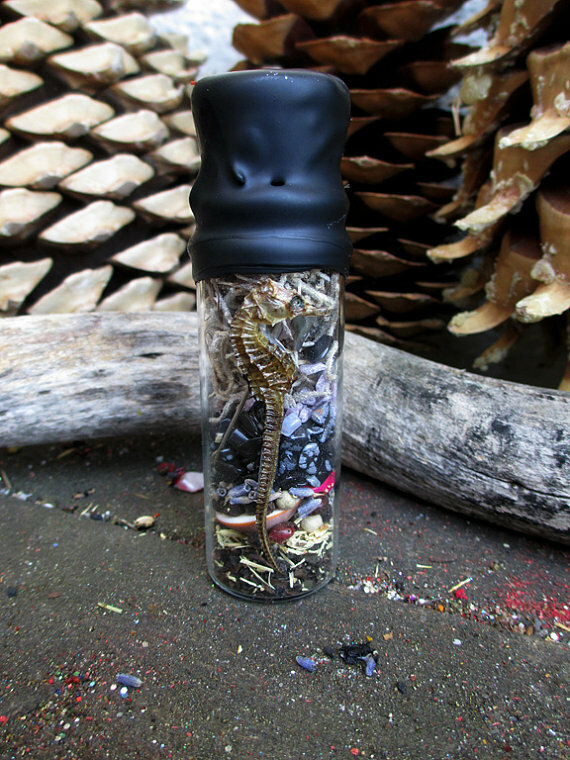 The seahorse is a good luck symbol and also carries meanings of patience and peristence. 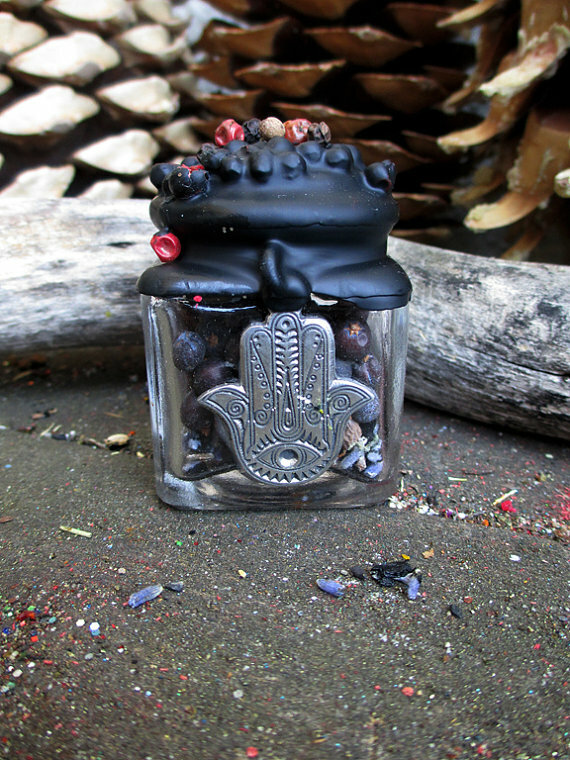 I bought this Hand of Fatima charm bottle at the same time, I just really like that symbol (also known as a hamsa). I recently bought a necklace that looks like a rosary except there’s a hamsa on the end instead of a crucifix. In this one I can identify allspice berries and lavender, which I use in every positive work I make myself, an evil eye bead, and a skull bead. 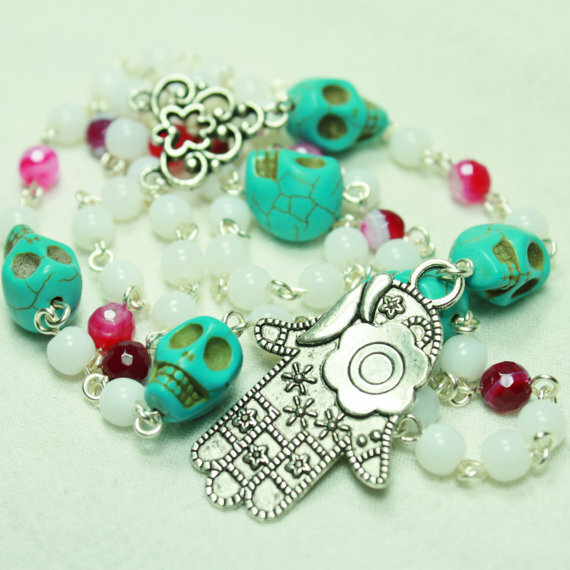 The skull is a near-universal symbol with a thousand different meanings, but in Conjure charms meant to bring fortune to the bearer it usually has a “reverse bad luck” meaning. I like that I can identify some of the contents and know why they’re there, but I also like that I can’t identify everything. Good rootworkers for the most part “follow the recipe”, but we all have idiosyncracies. It’s like cooking: before you can be great you have to be able to re-create the classics, but once you have that down, a little improvisation can make the dish amazing. This is the necklace I mentioned. The Etsy seller was shutting down her shop, so I got it for 40% off. Honey jars are old school Hoodoo, used to sweeten up your life. Some workers claim they can only be used to sweeten specific people to you, but I’ve spoken with older workers that wouldn’t agree with that. And they don’t always have to have candles burned on top–if you’re trying to sweeten a person, then you “set a light on them”. 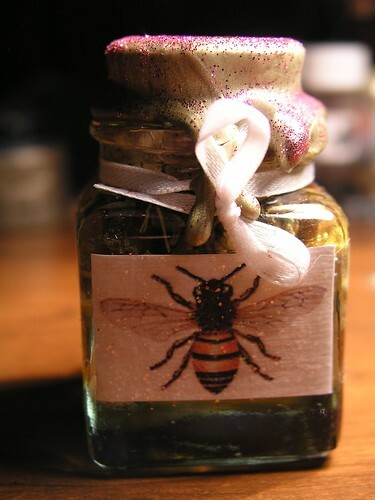 If you’re keeping a honey jar to make your life sweet in general, then just keep it on your altar or other charged space and let it do its work. Saint Rita is the matron saint of all women, but especially of abused women or women in difficult situations. (She was married at age 12–!! !–to an alcoholic who abused her.) She is associated with bees because as an infant, a cloud of bees was observed flying into and out of her open mouth as she slept, but caused her no harm. 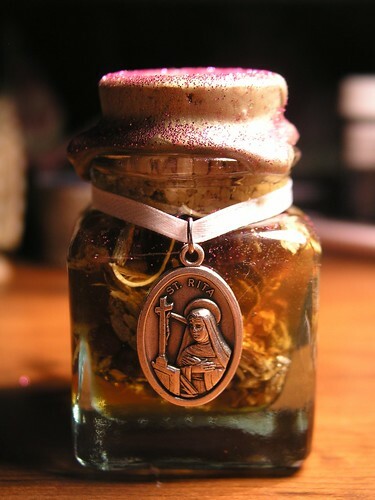 So what better saint to help me with a honey jar? The back. This is a very small jar, just a couple of inches high. 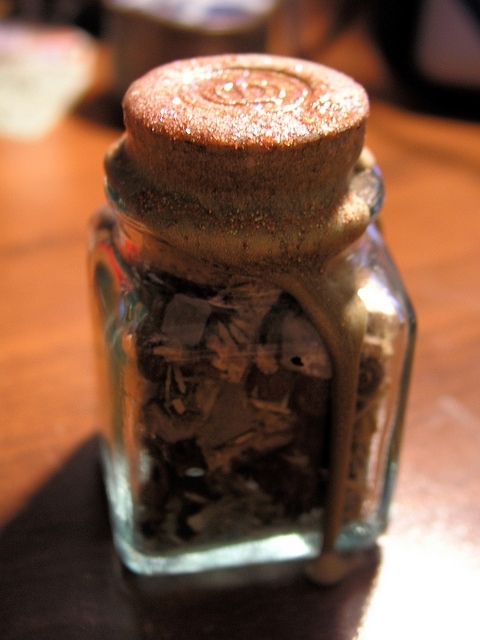 Inside are allspice berries, lavender, shredded angelica root, and a single dried rosebud. Roses, along with figs, are a traditional offering for Saint Rita. As she was dying, her cousin asked her if she could get her anything. Rita asked for roses; the cousin went out into the garden but didn’t expect to find anything because it was winter. She found a single rose and a single fig. She is called “the Saint of the Impossible”, and like Saint Jude can be petitioned for success in lost causes. Loaded cowrie shells are an idea I got from Rita’s Spiritual Goods. 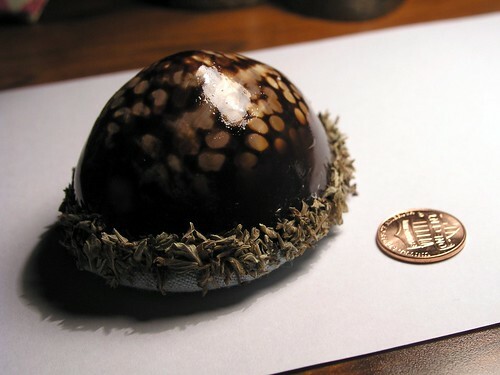 I actually bought one of hers, although I haven’t gotten it yet; in the meantime I wanted to make one of my own with a humpback cowrie I already had. I really like the idea, although I don’t know how traditional they are. I’ve been told they are, but I’ve only seen them in Rita’s shop and in another online store that I’m pretty sure got the idea from her. They feel traditional though, and of course cowrie shells are not uncommon in African-derived religions. Inside I put crushed pine incense, frankincense, blessed Dead Sea salt crystals, and dried orange peel. Those are all cleansing/protecting ingredients. 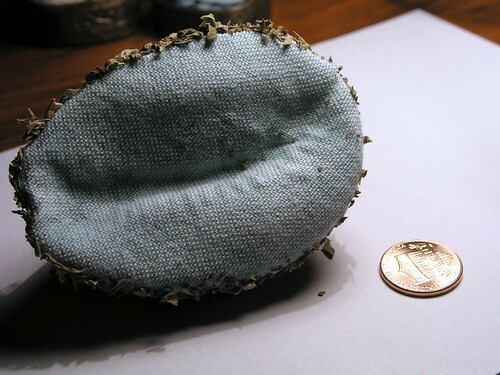 The bottom is covered with blue linen from an old napkin, and I pressed the line of glue around the edge into dried pennyroyal, then dressed the shell with Blessed Oil. The smell of the stuff inside passes through the fabric, especially when you shake it up and get the juju flowing. The one I bought from Rita has healing ingredients, so I don’t feel like having two of them is going to be superfluous. I think this is the last oil that I’ll make for a while. 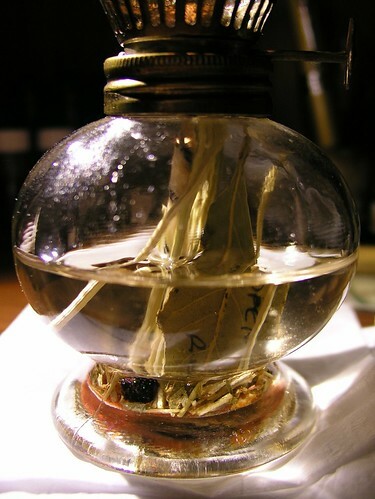 There are hundreds–possibly thousands–of different Hoodoo condition oils, but there are maybe a dozen that you’d use on anything like a regular basis*. This isn’t even one of them, I just made it because I thought it looked fun and I had one more bottle from World Market that wasn’t being used. 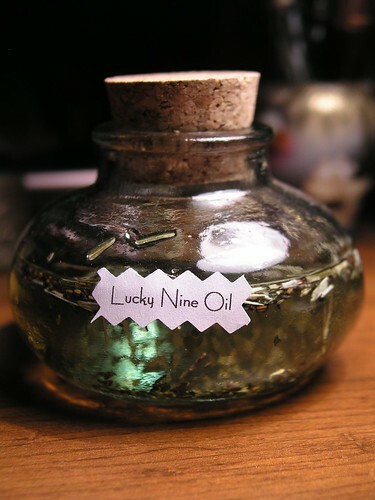 Lucky Nine Oil is a very NOLA-specific condition oil, and you’ll always find it in books by NOLA-area workers like Anna Riva and Denise Alvarado. It’s called that because it has nine ingredients, and you’re supposed to add nine drops to your bath for nine days in a row to get what you need. (It’s said to work well for those seeking employment.) Nine–three threes–is an especially lucky number in African-derived magico-religious systems; it’s also a sacred number in Catholicism, folk or otherwise, hence the novena, which literally means “nine” and lasts for (yup) nine days. Add a few pinches of dried vervain and blend in a base oil that’s light and sweet-smelling, like almond or sunflower. This is an oil where I wouldn’t substitute dried herbs or resins for the oils, because as mentioned, it’s primarily a bath oil, so you want it to be liquid. *The only one I haven’t attempted to make myself is Van Van Oil. For whatever reason, I prefer to buy it; I like to get it from different sources and compare. Everyone makes it slightly differently: some people make a cheap and easy version with just lemongrass oil and vervain; some people go so heavy on the citronella that it smells like bug spray; some people sweeten it up with lots of lemon verbena. I drove down to Arabi last Saturday to photograph the remains of LeBeau Plantation (look for a blog post about that later), and on my way back through NOLA I stopped at F&F Botanica, where I’d never been before. I was so overwhelmed by their candle selection that I forgot about everything else, and I’m kicking myself for not getting some of their Van Van Oil. I guess I’ll just have to go back soon! This is apparently one of those oils that has lots of different recipes, I’ve seen several and very few of them had more than one or two ingredients in common. The one commonality is that they seem like they’d all be very sweet-smelling. In the end I wound up pulling elements from a few different recipes, so this is more or less a custom blend. It’s ylang ylang, lavender, orange, patchouli, and sandalwood oils in a base of sweet almond oil, with pinches of angelica root and agrimony. 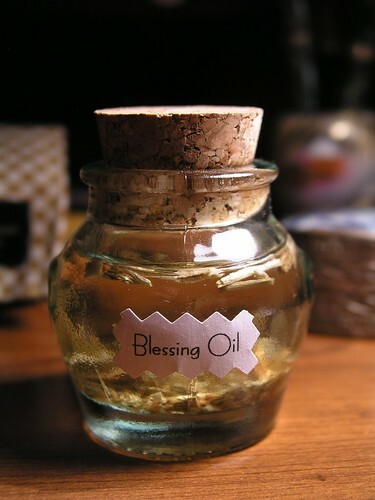 Blessing Oil is an all-purpose oil for petitioning saints (some saints have their own personal oils, but in a pinch you can use this one for any saint); it can also be used in candle spells, in floor washes or baths, and as a personal scent. The bottle is another $1.99 bottle from World Market. This is something I made out of a Topo Chico bottle (a Mexican brand of sparkling water) when I noticed what a lovely shade of green it was. To a lesser extent, yellow is also associated with money in Hoodoo–yellow for gold–but green is the most traditional color. Also, I like green better than yellow. They don’t have twist-off caps, but if you very gently pry off the cap in several spots, it will remain unbent enough to enable you to pop it back onto the bottle neck. I made a hole in the cap with an awl and fed my wick through it. I’ve given up using vegetable oil and natural wicks–they were always going out and required constant fussing with, and I just got tired of it. I bought some woven wicks and some paraffin oil on Amazon and I’m much happier with the results. (Also, paraffin oil does not go rancid.) Spring for the the ultra pure-burning stuff, it doesn’t smoke or smell at all. 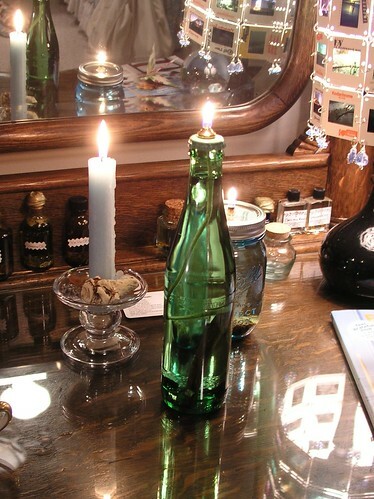 And make sure the bottle says it’s for oil candles, not just oil lamps–technically these are oil candles and not lamps. I had a really cool idea for a paperless name paper that involved carving my initials onto an array of coins that added up to my age–which means I’d have had to to add another penny on November 23rd–but alas, the neck was too narrow for coins, even dimes. So instead I wrapped some paper money around one of my business cards, and put it under the lamp.